After East Anglia, Wales has the UK's second largest expanse of fen. Several of these are in North Wales and include four National Nature Reserves (NNRs): Cors Erddreiniog, the largest of the three, is on Anglesey together with Cors Bodeilio and Cors Goch; while Cors Geirch is on the Lleyn Peninsula. These NNRs are sited on a rare type of wetland fed by alkaline water that drains into the fens from porous limestone rocks that surround them. When wetland habitats are on peaty soil over sandstone, granite or other chalk-deficient substrates they are normally acidic in their composition. It is the alkaline water draining into these wetlands in Wales that creates the conditions leading to the unusual combination of plants that are found there – many of which can exist only in this type of highly-alkaline habitat. These plants in turn support many animal species, including a number of insects that are becoming increasingly rare elsewhere in the UK. A walk in any of these nature reserves in spring and early summer, when they are full of flowers and buzzing with insect and bird life, clearly demonstrates why this habitat is of such international importance that is has to be protected by both national and international conservation designations. At the time of writing the Anglesey Fens, along with Cors Geirch on the Lleyn Peninsula, are the subject of the biggest wetland restoration project in Wales. Under the LIFE+ programme 2007, work on a five-year partnership project began in February 2009, and its main objective is to bring 751 hectares of this important wetland habitat up to favourable conservation condition and so to maximise their conservation potential. As well as improving wildlife habitats, the LIFE+ project also has a focus on the people who live and work in the area, and it is hoped that local schools and businesses will benefit from the work being carried out and from increased visitor numbers to these wildlife havens. Cors Geirch is managed by Natural Resources Wales (NRW). From Nefyn follow the A497 towards Pwllheli. Continue along this road to a right hand turn onto a small road signed towards Hendre. Turn right at the T junction and you will find the entrance to Cors Geirch off the left hand side of this road, which eventually leads to the small village of Ceido. There is currently no formal car parking area to gain access to Cors Geirch; it is a matter of trying to find somewhere on one of the narrow roads that surround the reserve and putting your car somewhere that doesn't block access for other vehicles. Because of the restoration programme being carried out at Cors Geirch there are lots of muddy areas in and around the reserve, and so good waterproof footwear is essential. There are no paths through the southern part of the reserve, and the central part is steep in places. The best access is from the northerly end - see above. Research suggests that the complex habitats found at Cors Geirch are centred around the site of a large proglacial lake which, over many thousands of years, has become a bog, but one with an unusually high level of alkalinity. Like the Anglesey Fens, Cors Geirch is surrounded by a ridge of limestone rocks, and it is the rainwater filtering down through these porous rocks that carries dissolved minerals into the bogs to create rare wetland habitats known as calcareous fens. This type of habitat supports rare and endangered wildlife species including many invertebrates; however, it is for their rich and diverse plantlife that the Fens in North Wales are probably best known. Cors Geirch is particularly special in this respect, since it was here that the first record for Wales of the rare Narrow-leaved Marsh Orchid (Dactylorhiza traunsteinerioides) was made in 1953 by the distinguished Botanist Professor William S. Lacey. This orchid also grows in the Anglesey Fens at Cors Bodeilio and Cors Erddreiniog. Black Bog Rush (Schoenus nigricans) has also become very rare in the UK due to the drainage of many of our fenlands; this distinctive plant grows to about a metre in height and has large black tufted fruiting heads that can be spotted from quite a distance. Black Bog Rush requires a very specific habitat with highly calcareous actively-moving spring water, and plenty of it. Restoring healthy populations of this plant to the fenlands of Wales is one of the top priorities for the work being undertaken under the Life+ project mentioned above, and if its numbers increase this will be an excellent indicator that the restoration programme is going well. 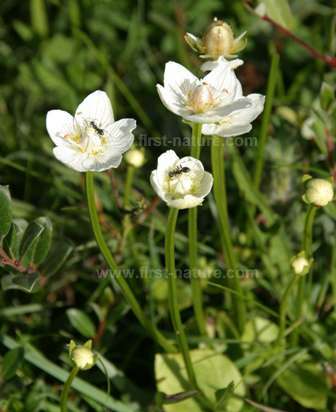 Another nationally rare plant that grows in Cors Geirch is Slender Cottongrass (Eriophorum gracile), and it keeps company with some other interesting and beautiful species such as Grass-of-Parnassus (Parnassia palustris) and Marsh Cinquefoil (Comosum palustre). The wetter areas of the Reserve are good places to see rushes and sedges which are typical of fenland habitat. Bottle Sedge (Carex rostrata), Tufted Sedge (Carex elata), Blunt-flowered Rush (Juncus subnodulosus), Slender Sedge (Carex lasiocarpa), Brown Sedge (Carex subfusca) and Great Fen Sedge (Cladium mariscus) all grow there. Marsh Fern (Thelypteris palustris), now nationally scarce, also finds a home here. Royal Fern (Osmunda regalis), one of my favourite wetland plants, is also a feature of Cors Geirch. 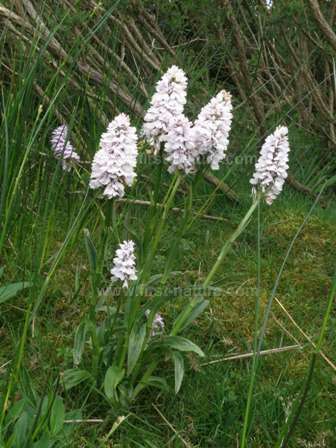 Apart from the Narrow-leaved Marsh-Orchid (Dactylorhiza traunsteinerioides), several other wild orchids grow in the reserve. At the right time of year (early to mid-June is ideal) you can expect to see Lesser Butterfly-orchid (Platanthera bifolia), Early Marsh-orchid (Dactylorhiza incarnata), Heath Spotted-orchid (Dactylorhiza maculata), Common Spotted-orchid (Dactylorhiza fuchsii), and, later in the season (July and August), Broad-leaved Helleborine (Epipactis Helleborine). 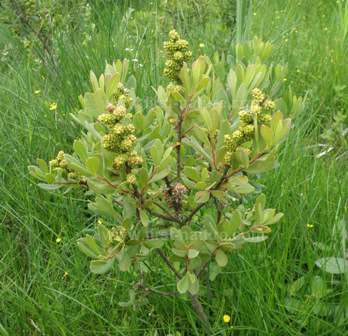 Below: Bog Myrtle is still common at Cors Geirch, although it is scarce elsewhere. This wonderful nature reserve has plenty of invertebrate life including two scarce damselfles, the Small Red Damselfly (Ceriagrion tenellum), which has not been recorded from the fen reserves in Anglesey, and the Blue-tailed Damselfly (Ischnura pumilio). These two have been joined by a recent colonist, the Black-tailed Skimmer (Orthetrum cancellatum) which is a new Dragonfly record for the site. The Hornet Robber Fly (Asilus crabroniformis) lives on this Reserve, which is probably its most northerly British site. Even more special is the presence of a beetle called the Black Night-runner (Chlaenius tristis) which has been recorded recently in Britain only at Cors Geirch. The decline in numbers of this beetle to just a single site on the Lleyn Peninsula means that its habitat, and the beetle itself, must be afforded a high degree of protection. The Black Night-runner is most specific in its habitat, which must be both very wet and have patches of open ground. Two nationally rare snails, Geyer's Whorl Snail (Vertigo geyeri) and Desmoulin's Whorl Snail (Vertigo moulinsiana), add to the impressive list of species dependent upon the special features of this wet wonderland.